My husband's birthday is coming up and I still don't know what I'm going to get the man, (after 23 years of marriage you would think that I'd have this down to a science). For the past two years on MY birthday he has given me gift certificates to my favorite antique shops, so I guess he doesn't have it down to a science either, (and I always thought I was easy to buy for). Last year, about four months before his birthday I found a beautiful old desk at an antique store and put it on lay-away, using my "mad money" to make payments so he wouldn't suspect, which he didn't. He was very surprised and quite impressed that I pulled it off, and I think he even liked it - an added bonus! This old brush, however, reminds me of one of his birthdays that I didn't pull off. I bought this vintage brush for my husband's birthday about ten years ago. I'm not sure what kind of brush it is - I always thought it was a shoe brush but now that I've been watching "Downton Abbey" episodes on the telly, I don't know what it could have been used for (those gentlemen seemed to have a brush for everything back then). It is made of soft leather, and the bristles are definitely made from some type of animal hair. The inscription reads: "R.O. 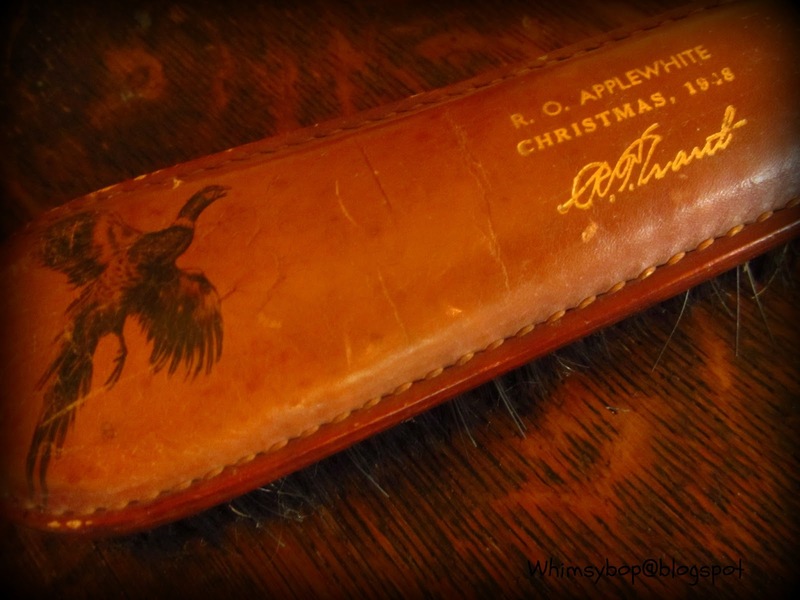 Applewhite Christmas 1948" and is signed, although I can't make out the signature. 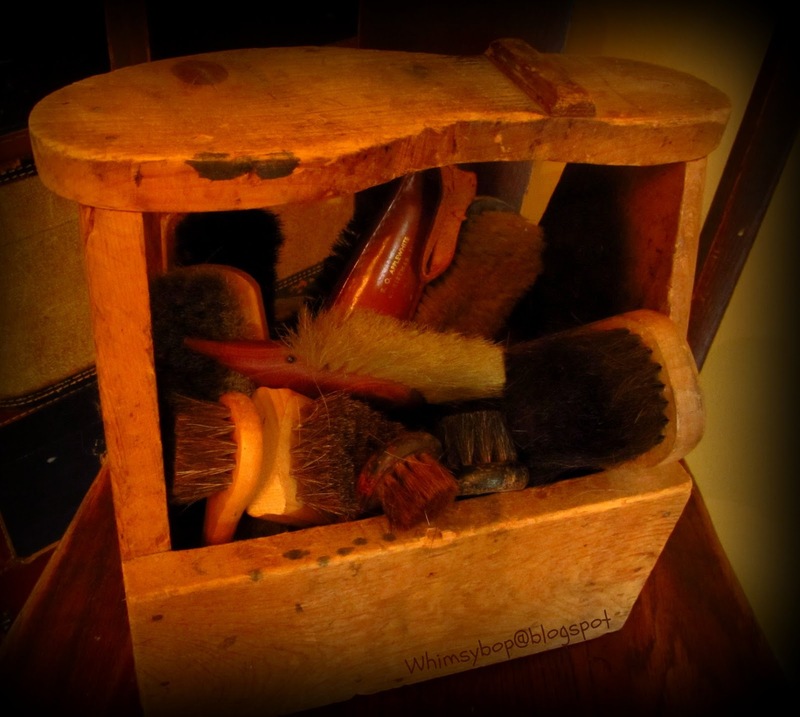 I put the brush in an adorable little shoe shine box I found at a yard sale and filled it with a few more brushes, old and new, along with various cans of shoe polishes and leather conditioners. I truly thought he'd be impressed with such a gift, because, after all, he was as a Marine and had a thing for shiny shoes, boots in particular. As soon as my husband opened his gift I could tell that he wasn't nearly as thrilled to receive it as I was to give it. He politely said "Thank you" and put it down on the floor where it remained and eventually made its way behind the living room door. The funny thing is no matter where we've called "home" these past ten years, that shoe shine box always gets unpacked and placed behind the living room door (it does make an excellent doorstop). Thankfully, he's a good sport and doesn't complain; perhaps he has come to terms with the fact that his wife enjoys shopping at antique malls much more than going to shopping malls. Getting back to that old brush. I get warm fuzzies when I find an old treasure that has been marked with an inscription. It shows, in a tangible way, it belonged to, and was used by, someone who is no longer with us. It's almost as sacred to me as a tombstone in a forgotten old cemetery. I also love the fact the giver of the gift was kind and generous enough to go the extra mile and not only present something special, but mark it in a way that would always remind the recipient of a milestone or special event in their life. We hardly do that anymore. Maybe it's because things aren't made to last; most items are manufactured so inexpensively it's not worth the money to put an inscription on. Perhaps, too, it's because our generation seems to become tired and bored with our stuff - we like to change things up, get rid of the old and start fresh every so often. I'm just as guilty as the next person. The sad reality is we don't see things as valuable nor hold onto things to pass them down to others as generations have done before us. Regardless of the reasons, inscriptions make these treasures of the past all the more endearing because they have been marked with love. Now if I could only find the "perfect" treasure to present my dear husband to mark his birthday with love and make his heart go pitter patter as it does mine - wish me luck! Question: What do YOU get for a man who doesn't seem to need anything? I've heard more than once that the best gift can be an experience. Is there something he's always wanted to do? Hang gliding, riding an antique train, going to Chuck E. Cheese without the kids...no, wait, NO ONE would want that! But something that would create a memory. That said, my husband and I agreed years ago not to give each other gifts for 'enforced' gift giving occasions. If we find something we know the other would like, we give it no matter the time of year. And no hassles at birthdays, anniversaries etc. What a relief! Tell me, did you & your husband begin your "new" tradition when the kids were still living at home or after they left the nest? Our kids are finally at the age where they are buying gifts with their own money and it's really fun to see what they come up with! I read once where a couple re-gave anniversary and birthday cards to each other, (cards from their younger days) - I kind of like that idea too! Thanks for the neat idea oh Queen! We don't have kids, which probably made the whole thing easier. And we've done this at least 30 years; the beginning of it is lost in the mists of time. ;o) Teaching your kids how to give a good gift is important (as well as how to accept a gift or compliment). Wait, that gives me another idea. How about giving compliments instead of gifts? Everyone could write down something they really appreciate about the recipient, something they did or some quality. If you did it regularly, it would foster an atmosphere where everyone is watching out for something positive to use on the next gift giving occasion.